See the book trailer VIDEO at the bottom of this page! Plus new tutorials are online here. 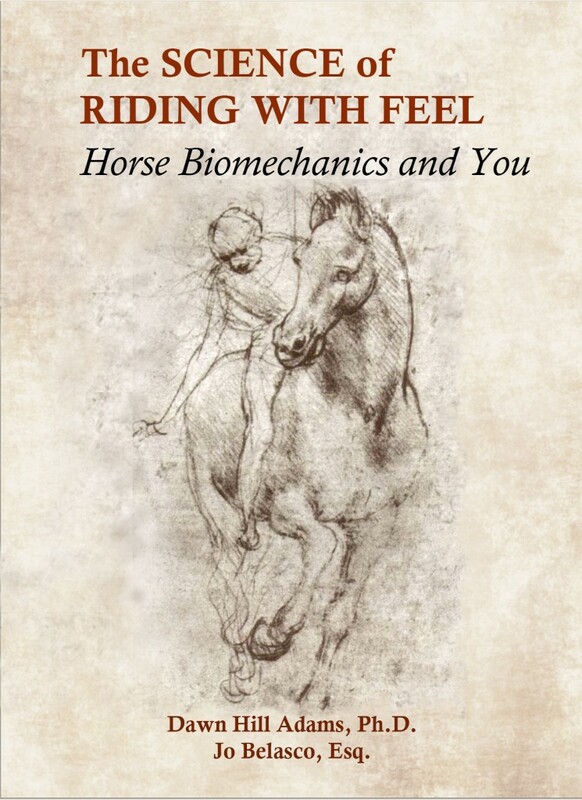 This mock-up cover for “The Science of Riding with Feel: Horse Biomechanics and You” is based on a sketch by Leonardo Da Vinci (1452-1519). The final cover will feature a re-drawn image of the same figure. “The Science of Riding with Feel: Horse Biomechanics and You” is the book about horse biomechanics you need and want, that you’ve asked for. Written by a biomechanics research scientist and a professional horsewoman, the project has been 10 years in the making, the last two in research, writing, and illustration planning. Now the book is slated for delivery to the horse community in fall of 2015. Final book production is possible thanks to the wonderful backers of our successful Kickstarter campaign. Find out why the book was written, who it’s for, and why we say it’s a book for the whole horse community. Learn what’s in the book — and in the supplemental materials that will be available online for free use and download. Read the Introductory Chapter to see how we approach the subject and why you’ll enjoy every moment of learning real horse biomechanics from authors Dawn Hill Adams, Ph.D. and clinician/trainer Jo Belasco, Esq. See samples of the over 100 illustrations in the book. Learn about the scientist and the horsewoman whose collaboration produced this fascinating book, and why they are uniquely qualified to explain horse biomechanics in a way that helps every rider develop feel. “The Science of Riding With Feel: Horse Biomechanics and You” combines real biomechanics with real riding in the book horsepeople have been waiting for, asking for, and deserve. Produced by Dawn Hill Adams, Ph.D. and Jo Belasco, Esq., 2015. Understanding the Horse, LLC. If you like this book, you may also be interested in the work of the Horse-Human Relationship Program of Tapestry Institute.